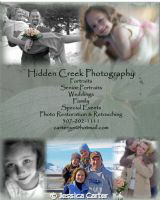 Hidden Creek Photography is a home based studio that offers something for everyone. Everything from Weddings, Family, Senior, Children and Pet Portraits. Hidden Creek Photography also offers photo Restoration and Retouching.